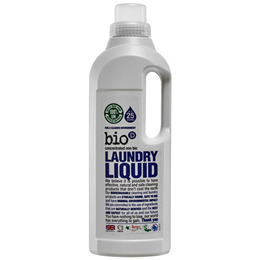 Bio D`s Lavender Laundry Liquid is accredited by Allergy UK; its super-gentle but super-effective concentrated formula can be used in automatics, twin-tubs and for washing delicate fabrics by hand. This Bio D product is made from 100% post-consumer waste (from the UK), this means that the bottle is made from 100% recycled materials, and is also 100% recyclable. This means the amount of wastes in landfill is reduced, and the overall energy consumption from producing this bottle is reduced by minimising the use of virgin plastics. The best bit is the new packaging doesn’t look too dissimilar to the old packaging, so they it will continue to look good around the home too! Bio D are committed to making cleaning products that don’t cost the earth and contribute to a healthier, more sustainable planet. For more than 25 years they have been creating household products that are effective and kinder to the environment. Every one of the Bio D product boxes, sprays, hand pumps and bottles contains 100% of their very own product, which is made in their factory in Hull, England by them and no one else. They have complete traceability on their ingredients. Their products help to control traces of E.coli, Salmonella and MRSA; they’re safe for use in professional/trade kitchens, meaning additional peace of mind when you use them at home. Chemical Plasticisers, Formaldehyde, Glycerin or Glycerine, Sodium Tallowate, Synthetic Dyes, Synthetic Perfumes, Titanium Dioxide, Phosphates, Enzymes, Optical Brighteners, Urea, Lanolin, Methylisothaizolinone, Tallow, Triclosan, GMO/SMO, Chlorine Bleaches, Petroleum-Derived additives. 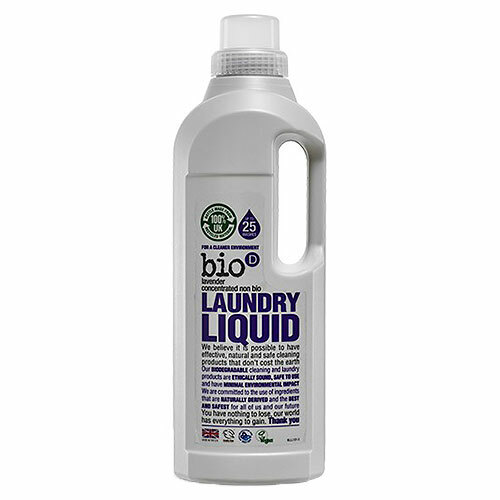 Below are reviews of Bio D Laundry Liquid with Lavender - 1 Litre by bodykind customers. If you have tried this product we'd love to hear what you think so please leave a review. Use it for my black and coloured clothes and it does a good job.